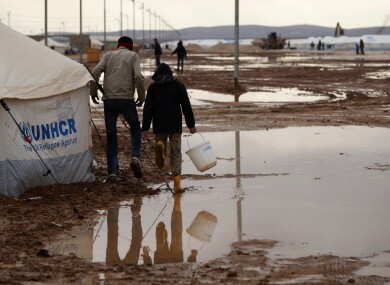 Syrian refugees walk on water and mud, at Zaatari Syrian refugee camp, near the Syrian border in Mafraq, Jordan. TORRENTIAL RAINS SWEPT through desert Jordan for a second straight day today, sparking widespread flooding, as severe weather swept through the Middle East, including war-torn Syria. In Israel and the Palestinian territories, heavy rain continued to fall on and temperatures dropped ahead of possible snowfall, while Egyptian authorities closed the port of Alexandria for a third straight day due to severe winds. The main road between the Jordanian capital and the northern city of Zarqa was closed as sections were swamped by up to a metre of water, and flash floods overwhelmed Amman’s drainage system, forcing the closure of most road tunnels and gridlocking traffic. At the Zaatari camp on the border with Syria, “refugees started to push each other as they ran towards aid workers. They hurled stones at each other and there was a stampede, which hurt some aid workers,” Anmar Hmud, a government spokesman for refugee affairs, told AFP. “At least one of the aid workers was taken to hospital,” he added. The incident occurred as aid workers were helping some of the 62,000 Syrians sheltering in the camp, where two days of heavy rains have destroyed hundreds of tents. Jordan says it is hosting more than 290,000 Syrians who have fled the devastating conflict in its northern neighbour. Syria’s met office predicted abundant rainfall for the next two days, as heavy rains and wind hit several parts of the country, and a buildup of snowfall in Damascus made some roads unusable, the interior ministry said. In neighbouring Lebanon, a day after a six-month-old baby was swept away when a flash flood hit a Bedouin encampment, the storms continued across the country. Roads in Beirut were flooded and schools were closed nationwide for two days. The Damascus-Beirut road was also forced to shut and rains caused widespread damage to farmland. “Lebanon hasn’t seen a storm like this in a dozen years,” said Abdel Karim Damaj, a weather expert at Beirut International Airport. Elsewhere in the region, Jerusalem was bracing for possible snowfall over night tomorrow and Thursday, as temperatures dropped and heavy rain continued to fall on Israel and the Palestinian territories. Tel Aviv’s main transport artery reopened this evening after being closed due to flooding since the morning, causing large traffic jams. Trains were out of service for much of the day. Streets in many West Bank cities were flooded, and the Palestinian Authority ordered schools which were back from half-term to take Wednesday and Thursday off. Israel’s met office said this winter was set to be the wettest in a decade. Egypt closed the port of Alexandria for a third day in a row as a precaution, as high winds battered the Mediterranean city after torrential rains caused power cuts. Further west, 10 fishermen were reported missing off the coast of the desert town of Marsa Matruh, and searches to find them were being hampered by the weather conditions, local media reported. Email “Torrential rains hit desert Jordan, floods sweep Middle East”. Feedback on “Torrential rains hit desert Jordan, floods sweep Middle East”.